I would be willing to give it a shot. I am a 47 year old artist from Burlington, VT. My creative partner and I have recently ventured into webcomics; serializing our book HOLLIDAY: Mountain Madness – http://www.hollidaycomic.com (yes I am lagging behind in updates, but our meager fanbase is strong and understanding!) which will have an update on Saturday. I have been a freelancer since graduating high school in the mid 80’s- produced public access media and even did a 2 year tour in film school. I bring a knowledge of media, publishing and comics- I am a web addict and gobble down info every day(to the detriment of my work at times) about same. I know my comics history and my art technique- so I might be a good co-host in addition to any of the others you pick. I am also a newbie to plunging into webcomics (my infrequent postings will attest) so I might bring a fresh attitude. I can also bring the view of a slightly older artist who realized the transition into new media delivery systems was mandatory to succeed in being an indy comics creator and plunged in, rather than a youngster for whom this is “just the way you do it”. 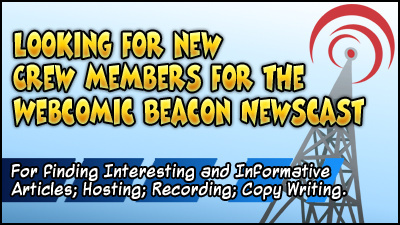 Shoot me an email at webcomicbeacon@gmail.com and I’ll get you added into a candidate rotation!